Romania: See “Bat Country” on the Summer Dracula Tour! Here’s a joke for you, Divas: What is Transylvania? Ugh. Sorry. Never mind. The point is, cancel all your summer plans, because Dracula Tours is offering a summer trip to Transylvania, July 9 – 16. As they put it, “the tour is part history, involving Vlad Tepes, and part mystery, surrounding the undead bloodsucker Dracula.” You’ll tour Vlad’s birthplace, preserved as it was in the Middle Ages, see Vlad’s coffin on Snagov Island, and visit the ruins of his castle, Poenari. Then you’ll take the same road up the Carpathian Mountains that Jonathan Harker follows in the novel, culminating in the truly awesome-sounding Monster Mash Masquerade Ball in the dungeon room at Dracula’s castle. This eight day, seven night trip includes airfaire, accomodations, meals, admissions, parties, and a lot more. To find out about costs and other information about this summer reign of terror, check out the website, or call them toll-free at (866) T-E-R-R-O-R-T-O-U-R or direct line (203) 795-4737 to have a free brochure sent to you. Fangs for reading! Yuck. Why can’t I stop? 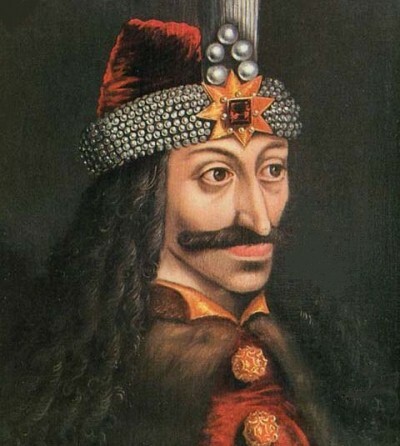 Vlad tepes, de Spietser is nog steeds een held!